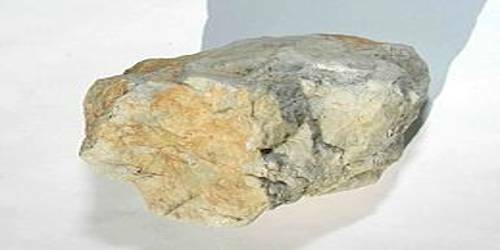 Amblygonite is a fluorophosphate mineral, (Li, Na) AlPO4 (F, OH), composed of lithium, sodium, aluminum, phosphate, fluoride, and hydroxide. It is a relatively common phosphate mineral. It is found in lithium and phosphate-rich pegmatites as a primary mineral. 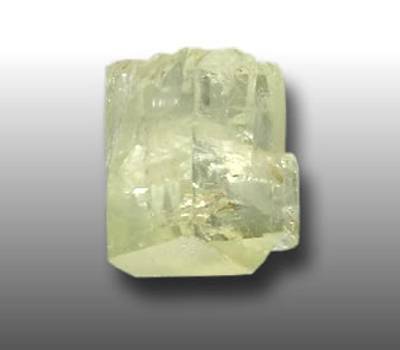 Amblygonite’s name comes from the Greek words for “blunt angles” in allusion to its variously angled cleavages. The mineral was first discovered in Saxony by August Breithaupt in 1817 and named by him from the Greek amblus, blunt, and gonia, angle, because of the obtuse angle between the cleavages. Later it was found at Montebras, Creuse, France, and at Hebron in Maine; and because of slight differences in optical character and chemical composition the names, montebrasite and hebronite have been applied to the mineral from these localities. Color: Generally white or creamy, but can also be colorless or pale yellow, green, blue, beige, gray, brown or pink. Notable Occurrences are Minas Gerais, Brazil; Montebras, France; Germany; Varutrask, Sweden; Sakangyi, Burma; Yellowknife, Northwest Territories, Canada. The mineral occurs in pegmatite deposits and is easily mistaken for albite and other feldspars. Its density, cleavage and flame test for lithium are diagnostic. Amblygonite forms a series with montebrasite, the low fluorine endmember. The geologic occurrence is in granite pegmatites, high-temperature tin veins, and greisens. Amblygonite occurs with spodumene, apatite, lepidolite, tourmaline, and other lithium-bearing minerals in pegmatite veins. It contains about 10% lithium and has been utilized as a source of lithium. The chief commercial sources have historically been the deposits of California and France.